Maybe every living room, sleeping room and even your working area should have an Essential Oil Diffuser . They improve humidy, make the room smell delightful, but some people even claim they can actually benefit the body, mind, and soul. To improve my inhouse climate, I decided to try out the Essential Oil Diffuser that I found on Gearbest. A relative safe bet, because it’s priced less than fifteen euros. Basic Informations: Power: 2W // Voltage: 5V // Input Voltage: AC100-240V // Connector Type: USB // Cord Length: 1m // Water Tank Capacity: 130 ml // Application Area (sq.m. ): 5-6 // Noise (dB): <25 // Working Temperature: -20-40 Deg.C. Product size (L x W x H): 10.00 x 10.00 x 9.50 cm / 3.94 x 3.94 x 3.74 inches. There are plenty of reasons to have an essential oil diffuser in your living room, your sleeping room and even your working area. Some of reasons are that they help you to relax, breath easier and sleep better. My main reason to try out the Essential Oil Diffuser was dry air in my house during the winter season. The cold weather outside combined with the heather air inside made the humidity in my house relatively low. This has negative direct effects on my body (for example dry lips) but also has indirect effects (germs flourish in these conditions). So that’s why I hope the Essential Oil Diffuser contributes to my in-house climate positively. 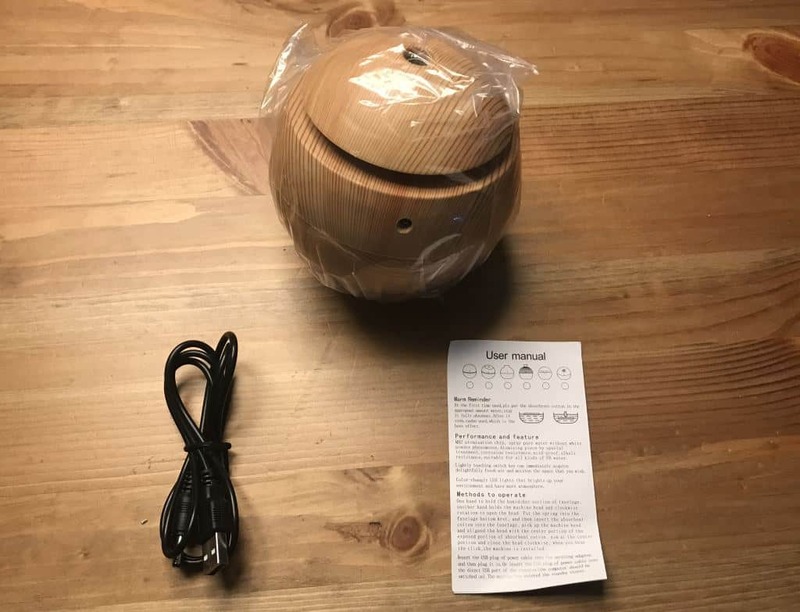 The essential oil diffuser packed well protected in a cardboard box. The package size is 12.00 x 12.00 x 16.00 cm (L x W x H). Mhz Atomization Chip, Spray Pure Water Without White Powder Phenomenon. Atomizing Piece By Special Treatment, Corrosion Resistance, Acid-Proof, Alkali Resistance, Suitable for All Kinds of Ph Water. Lightly Touching Switch Key Can Immediately Acquire Delightfully Fresh Air And Moisten The Space That You Wish. Color-Changing LED Lights That Brights Up Your Environment And Have More Atmosphere. As long as you do not touch it, it looks pretty nice with its wooden and comes over as a sturdy construction. But when you touch the Essential Oil Diffuser, you will notice it is just a light and plastic construction. 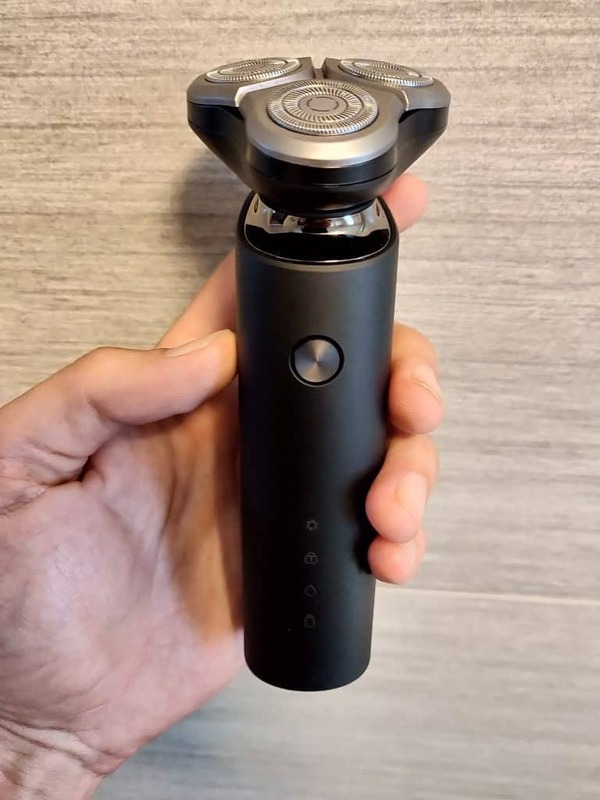 But it looks good and the atomization unit does a very decent job. No parts of the Essential Oil Diffusor get hot. We tested it for a decent amount of time but all parts became noticeably warmer. The power consumption is not that much, but we measured that the device draws 2,5 Watt instead of the specified 2 Watt. 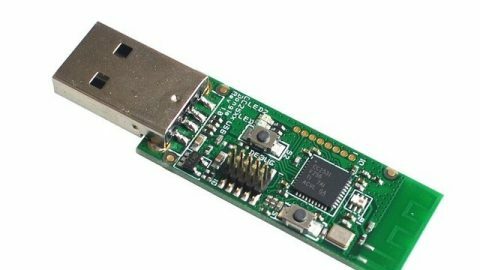 With its 5 V, you can even power it using a power bank. When I first switched on the Diffusor, it made a nasty beeping sound. But after I while I detected I did not assemble it correctly. After I fixed it the device did not produce any noise. Even the diffusing does not make any sound. Installation is not that hard, but there is a way to do it incorrect. You open the diffusor and fill the cup with water. Optionally, you can add a couple of drops of essential oil. Now you immerse the cotton stick for about half a minute in the cup. When the stick is soaked you put it in the center hole of the top cover so it can make contact with the atomization chip. After this step you put the spring in the holder and put the holder on top of the stick to fix the cotton stick in place. I did it incorrect by putting the spring on top of the cotton stick, so the stick did not make contact with the atomization chip. The device did no do anything but make a beeping noise. If the cotton is installed you can put the diffusor back together and connect the power cable to a USB adapter and you are ready to go! You can use the Essential Oil Diffusor with or without essential oils. When you switch on the device it starts to spray the water and the LED’s light up and change color slowly. When you press the button again the diffusor continues but without the LED lights. Only two cotton sticks are included. When you are thinking of buying a first aroma diffusor, the Essential Oil Diffusor is a good choice. Although the outer material is plastic it doesn’t look that way and the atomization chip does a very decent job. For me this was a proof of concept for an essential oil diffusor, but I am positively surprised. For my living room I am going to order one with a bigger capacity, but I use the unit now in my sleeping room and will continue to do this.